Siddal coach Gareth Greenwood praised classy stand off Shaun Garrod for getting his side out of a hole against Northumbria University in the Ladbroke’s Challenge Cup yesterday. The Chevinedge men were given a scare by the students before winning 18-16 and taking their place in Tuesday evening’s third round draw along with the Kingstone Press League One teams. Last season’s beaten Conference Grand Finalists were trailing 16-10 before Garrod scored one try and created another for winger Gareth Blackburn in the space of seven minutes early in the second half. 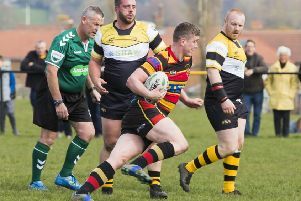 The home side missed chances to add to their tally after that, ensuring that the plucky visitors, for whom ex-Siddal junior Tom Shaw was an influential playmaker, were in the hunt right to the final whistle. Greenwood described the game as “dire”, accused his players of not being in the right frame of mind and was grateful for Garrod’s intervention. “It has taken the class of one player to get us out of trouble. He has come up with a couple of tries out of his back pocket,” said Greenwood. “Against a Keighley or a Hunslet or a South Wales in the next round we will have to be a hell of a lot better,” he said. On a cold but mercifully dry day, the suspect state of mind of the Siddal players was probably not helped when it took them less than two minutes to go 6-0 ahead. Mark Boothroyd pounced on a last-tackle grubber kick and Gareth Blackburn converted. All too easy? Garrod’s break created an opening for Scott Caley, who couldn’t hang on to the ball, before the lively students stormed back with two tries converted by Shaw to lead 12-6 after 17 minutes. Northumbria stacked the left side of their attack and Siddal were outnumbered, second rower Liam Richmond touching down twice. Siddal spread the ball wide for Blackburn to squeeze in at the corner on 24 minutes but the hosts were struggling to get out of first gear and Northumbria scored again six minutes before half time. Winger Danny Simpson sped away when a Siddal attack broke down and although Blackburn got back to haul him down, the enthusiastic students had the numbers there for Scott Harrison to comfortably score wide out. Siddal’s forwards managed to get some fire in their bellies for 10 minutes after the break against opponents who had fullback Doug Foster in the sin-bin. Garrod scampered over from the blind side of a scrum and his long floated pass enabled Blackburn to give Siddal the lead. The home side had the upper hand from then on and butchered a couple of golden opportunities but they also had to defend their line on occasions as the visitors took the plaudits if not the spoils.